The Econometric Modeler app enables you to transform time series data based on deterministic or stochastic trends you see in plots or hypothesis test conclusions. Available transformations in the app are log, seasonal and nonseasonal difference, and linear detrend. 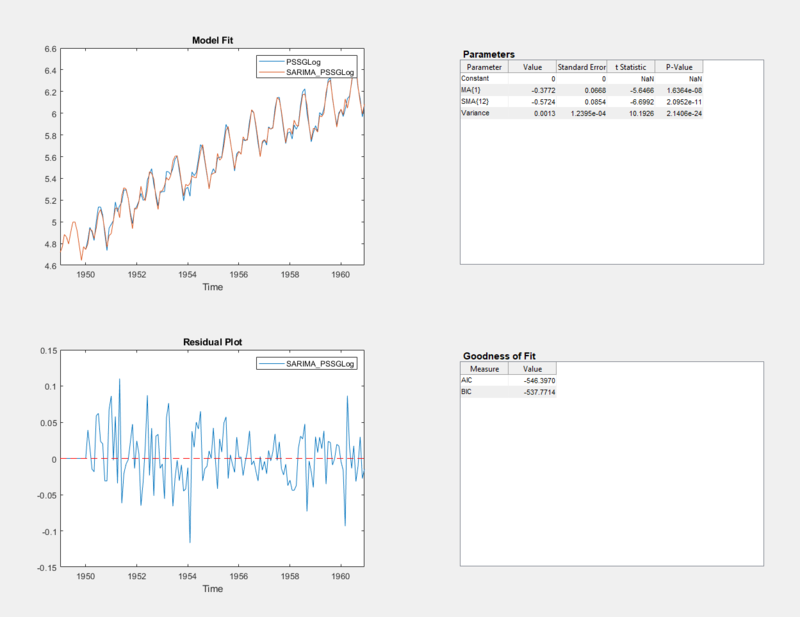 These examples show how to apply each transformation to time series data. 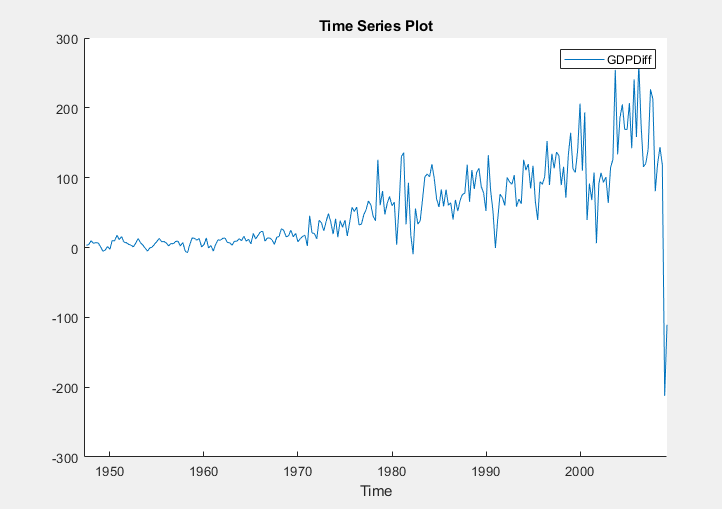 This example shows how to stabilize a time series, whose variability grows with the level of the series, by applying the log transformation. The data set, which is stored in mlr/examples/econ/Data_Airline.mat, contains monthly counts of airline passengers. The folder mlr is the value of matlabroot. 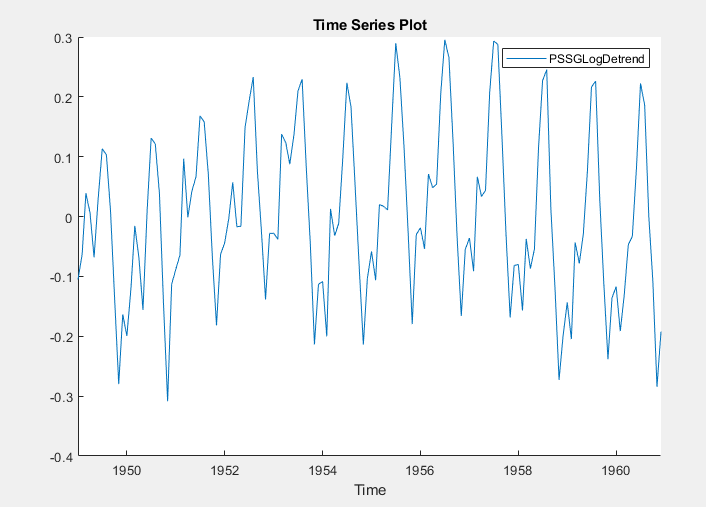 The variable PSSG appears in the Data Browser, and its time series plot is in the Time Series Plot(PSSG) figure window. On the Econometric Modeler tab, in the Models section, click the arrow to display the model gallery. In the models gallery, in the ARMA/ARIMA Models section, click SARIMA. The model variable SARIMA_PSSG appears in the Models section of the Data Browser and its estimation summary appears in the Model Summary(SARIMA_PSSG) document. The spread of the residuals increases with the level of the data, which is indicative of heteroscedasticity. The exponential growth appears removed from the series. With PSSGLog selected in the Data Browser, fit the SARIMA(0,1,1)×(0,1,1)12 model to the logged series using the same dialog box settings that you used for PSSG. The estimation summary appears in the Model Summary(SARIMA_PSSGLog) document. The spread of the residuals does not appear to change systematically with the levels of the data. This example shows how to stabilize a time series by applying multiple nonseasonal difference operations. The data set, which is stored in Data_USEconModel.mat, contains the US gross domestic product (GDP) measured quarterly, among other series. At the command line, load the Data_USEconModel.mat data set. 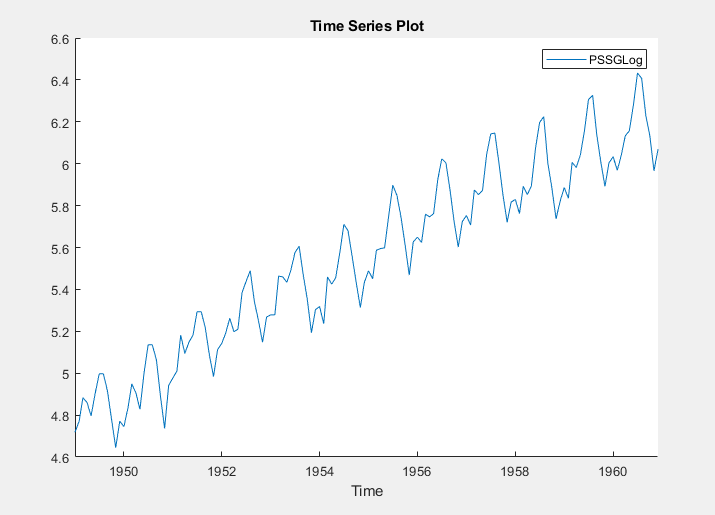 The variables, including GDP, appear in the Data Browser, and a time series plot of all the series appears in the Time Series Plot(COE) figure window. In the Data Browser, double-click GDP. 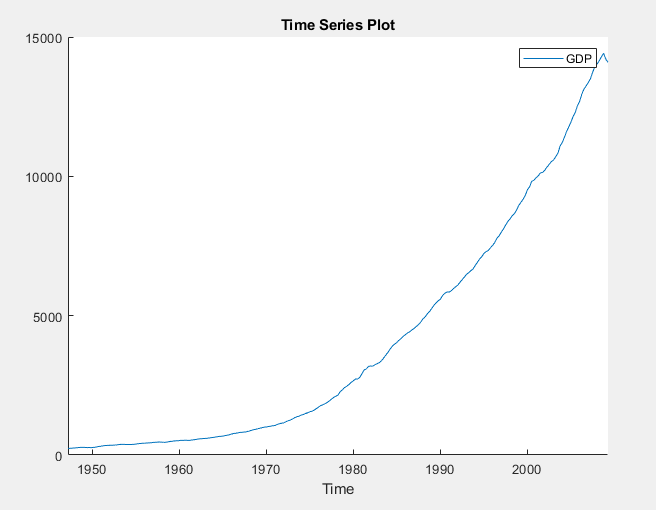 A time series plot of GDP appears in the Time Series Plot(GDP) figure window. The series appears to grow without bound. Apply the first difference to GDP. On the Econometric Modeler tab, in the Transforms section, click Difference. In the Data Browser, a variable representing the differenced GDP (GDPDiff) appears. 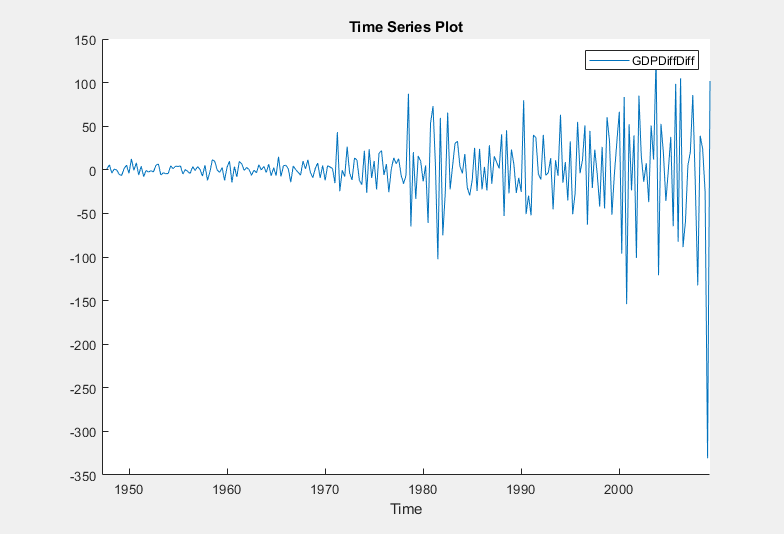 A time series plot of the differenced GDP appears in the Time Series Plot(GDPDiff) figure window. The differenced GDP series appears to grow without bound after 1970. Apply the second difference to the GDP by differencing the differenced GDP. With GDPDiff selected in the Data Browser, on the Econometric Modeler tab, in the Transforms section, click Difference. In the Data Browser, a variable representing the transformed differenced GDP (GDPDiffDiff) appears. A time series plot of the differenced GDP appears in the Time Series Plot(GDPDiffDiff) figure window. The transformed differenced GDP series appears stationary, although heteroscedastic. This example shows how to convert multiple series of prices to returns. The data set, which is stored in Data_USEconModel.mat, contains the US GDP and personal consumption expenditures measured quarterly, among other series. 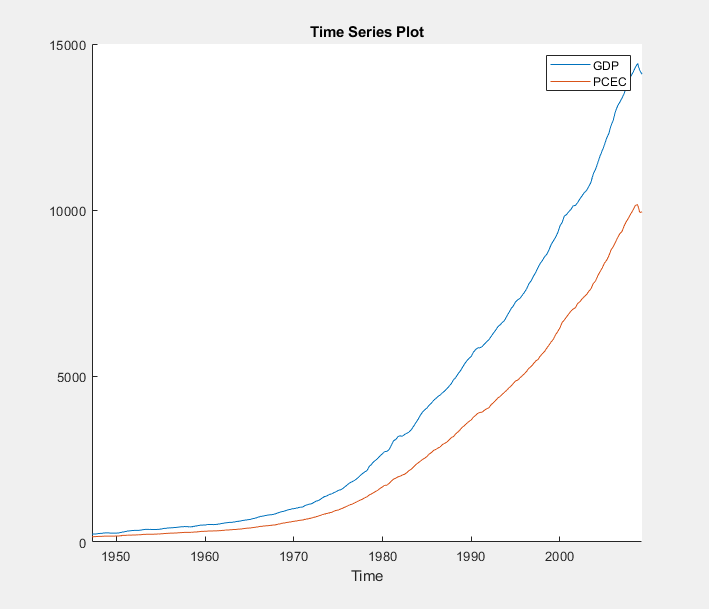 GDP and PCEC, among other series, appear in the Data Browser, and a time series plot containing all series appears in the figure window. In the Data Browser, click GDP, then press Ctrl and click PCEC. Both series are selected. 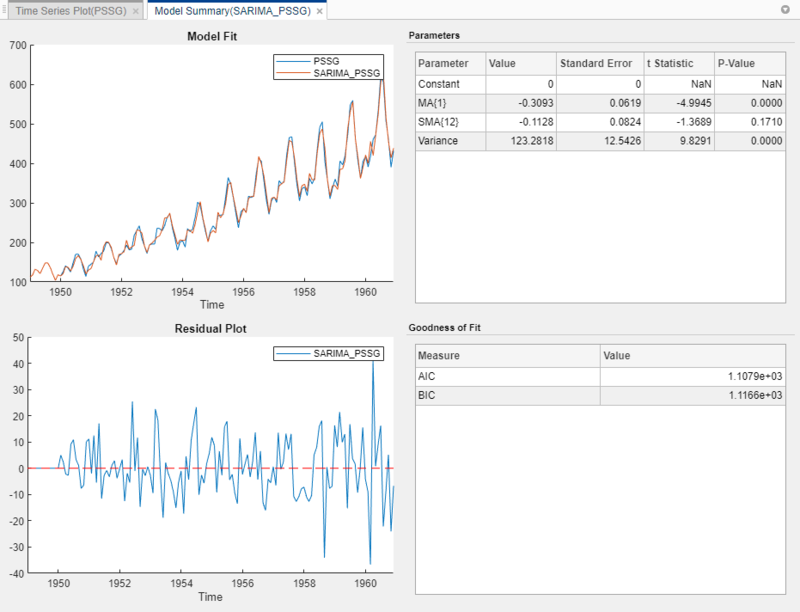 Click the Plots tab, then click Time Series. 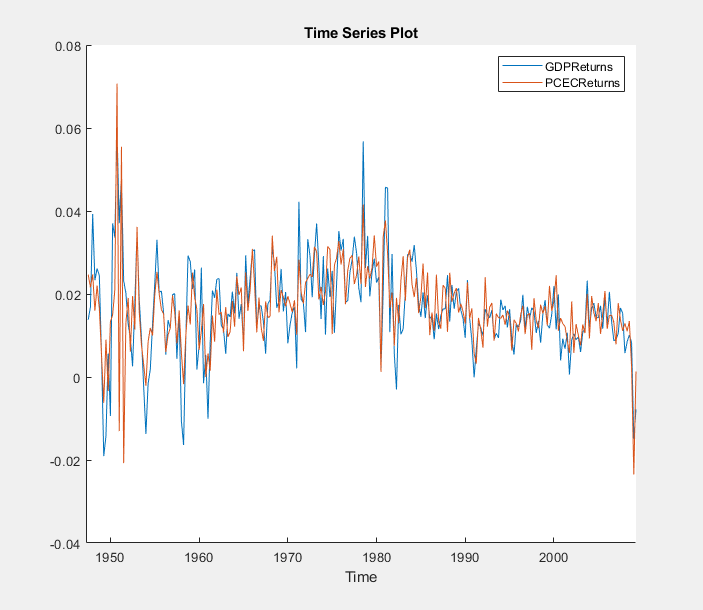 A time series plot of GDP and PCEC appears in the Time Series Plot(GDP) figure window. Both series, as prices, appear to grow without bound. Click the Econometric Modeler tab. 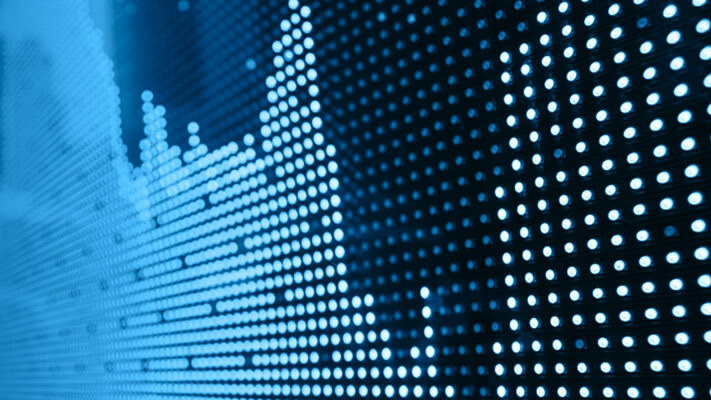 Ensure that GDP and PCEC are selected in the Data Browser. In the Transforms section, click Log. The Data Browser displays variables representing the logged GDP series (GDPLog) and the logged personal consumption expenditure series (PCECLog). With GDPLog and PCECLog selected in the Data Browser, in the Transforms section, click Difference. The Data Browser displays variables representing the GDP returns (GDPLogDiff) and personal consumption expenditure returns (PCECLogDiff). A time series plot of the GDP and personal consumption expenditure returns appears in the Time Series Plot(GDPLogDiff) figure window. In the Data Browser, click GDPLogDiff to select it and to deselect PCECLogDiff. In the Data Browser, right-click GDPLogDiff. Repeat steps 2 through 4 to rename PCECLogDiff to PCECReturns. The app updates the names of all documents associated with both returns. The series of GDP and personal consumption expenditure returns appear stationary, but observations within each series appear serially correlated. This example shows how to stabilize a time series exhibiting seasonal integration by applying a seasonal difference. The data set, which is stored in mlr/examples/econ/Data_Airline.mat, contains monthly counts of airline passengers. The folder mlr is the value of matlabroot. Address the seasonal trend by applying the 12th order seasonal difference. 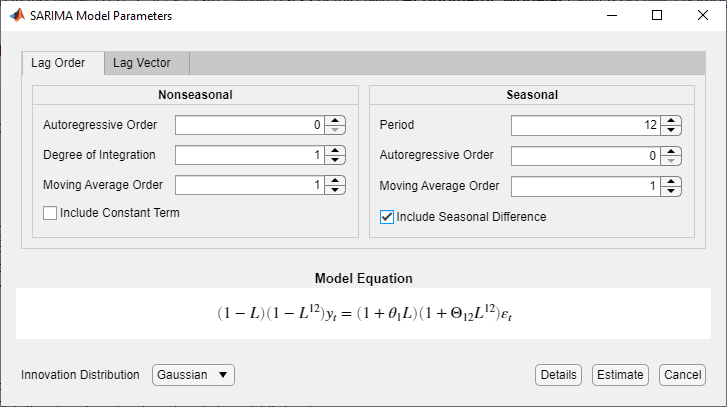 On the Econometric Modeler tab, in the Transforms section, set Seasonal to 12. Then, click Seasonal. 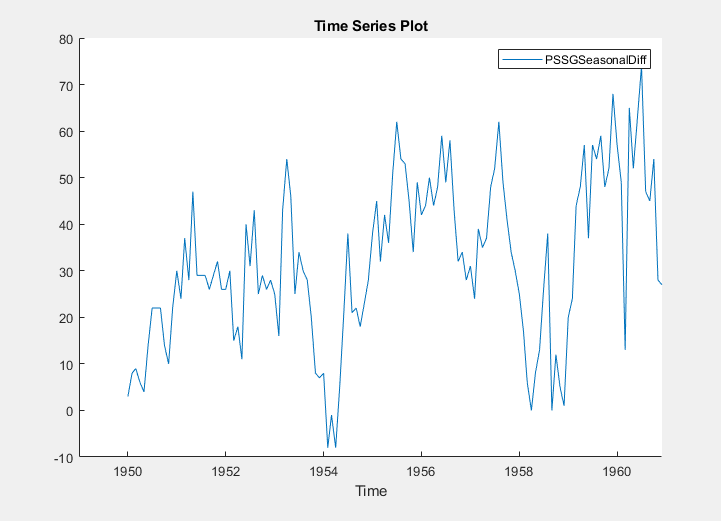 The transformed variable PSSGSeasonalDiff appears in the Data Browser, and its time series plot appears in the Time Series Plot(PSSGSeasonalDiff) figure window. The transformed series appears to have a nonseasonal trend. Address the nonseasonal trend by applying the first difference. With PSSGSeasonalDiff selected in the Data Browser, on the Econometric Modeler tab, in the Transforms section, click Difference. 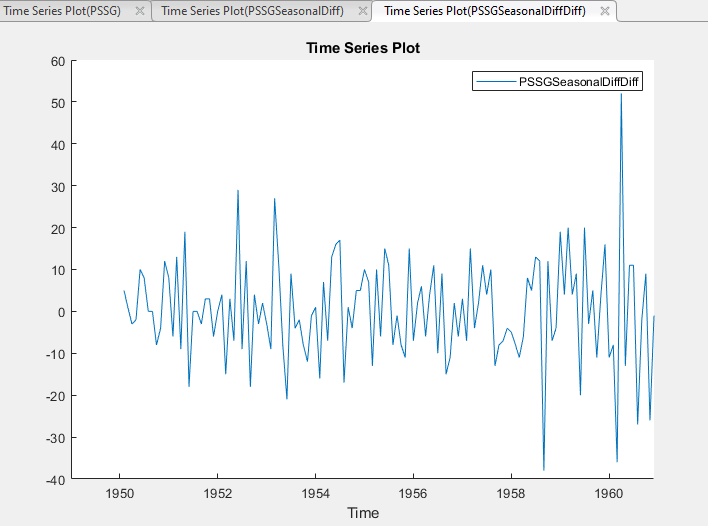 The transformed variable PSSGSeasonalDiffDiff appears in the Data Browser, and its time series plot appears in the Time Series Plot(PSSGSeasonalDiffDiff) figure window. The transformed series appears stationary, but observations appear serially correlated. In the Data Browser, right-click PSSGSeasonalDiffDiff. This example shows how to remove a least-squares-derived deterministic trend from a nonstationary time series. The data set, which is stored in mlr/examples/econ/Data_Airline.mat, contains monthly counts of airline passengers. The folder mlr is the value of matlabroot. Apply the log transformation to the series. On the Econometric Modeler tab, in the Transforms section, click Log. Identify the deterministic trend by using least squares. Then, detrend the series by removing the identified deterministic trend. On the Econometric Modeler tab, in the Transforms section, click Detrend. The transformed variable PSSGLogDetrend appears in the Data Browser, and its time series plot appears in the Time Series Plot(PSSGLogDetrend) figure window. PSSGLogDetrend does not appear to have a deterministic trend, although it has a marked cyclic trend.